I usually save music for Wednesdays, but this post is all about the video. As good as Ed Sheeran’s song “Bloodstream” is, it is Ray Liotta’s powerful performance I want to bring to your attention. I came across this video when I was reading TalkMusicToMe’s blog (which, by the way, is full of good stuff, and you should go check it out!). The video is so beautifully directed, so masterfully edited, so perfectly performed, it’s like a mini Oscar-worthy movie. It was released in connection with the 2015 YouTube Music Awards, of which Sheeran was one of 40 recipients. Sheeran is known for his great music videos. He’s already explored dance, and puppets, and doppelgangers, so I guess he decided it was time for legit drama. The story is simple. Liotta plays the rich, aging former front man for a hair band. We watch him partying with and singing at random attractive young women (prostitutes, presumably), but there doesn’t seem to be anyone actually in his life. His mansion is at once overdone and very bland. It also gives the impression of emptiness, which makes it a lot easier to ride his horse through it. 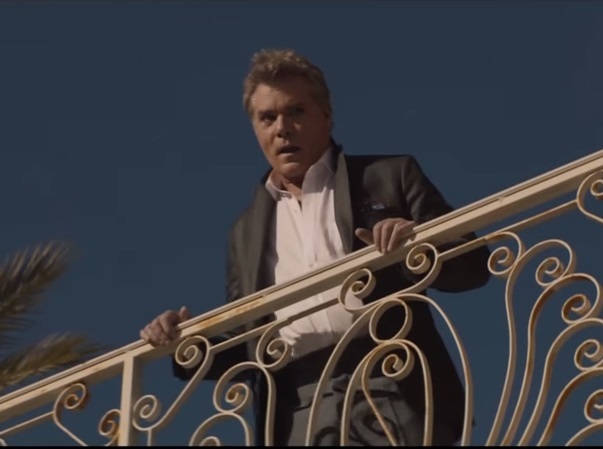 Liotta smashes stuff, sets things on fire, staggers around, jumps off of balconies into ponds, and just generally looks empty and miserable and wrecked. By the end, even the horse is like “Dude, get it together.” I know it all sounds pretty unexceptional, but the man brings all his years of stage craft to bear in this amazing performance. Ray Liotta is such a talent. I’m not a Ed Sheeran fan but I did like this video. I don’t really care about Sheeran one way or another. I like some, I’m indifferent about others of his songs. But this video really stayed with me. I just love Ray Liotta–those eyes!! Not sure you have room for either, but I know what you mean! Love Ray, always have thought he was great. I see what you mean by powerful! Enjoyed the video; the music was good, too. I’m glad you liked it as much as I did!